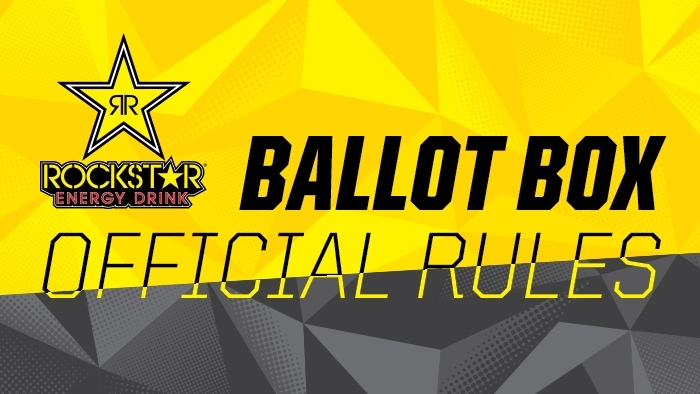 ROCKSTAR – GENERIC BALLOT BOX RULES NO PURCHASE NECESSARY. Eligibility: Open and offered only to legal residents of the state/province the Sweepstakes is offered, who are age of majority at the time of entry. Employees and directors of the participating store (collectively, “Sponsor”), Rockstar, Inc. (“Promotional Participant”) and their respective parent entities, subsidiaries and affiliated companies, advertising, promotion or production agencies, and their immediate family members or individuals residing in their same household, are not eligible to participate or enter. Void where prohibited. How to Enter: Complete the official entry form found on the ROCKSTAR entry box, while supplies last, or on a plain piece of 3” x 5” paper, by hand printing your complete name, age, address, zip code, and daytime telephone number and depositing the completed entry form in the ROCKSTAR entry box available at participating stores. All entries must be received by the deadline indicated on the ROCKSTAR entry box or in-store point-of-sale materials to be eligible for the random drawing. Any entries received after the deadline will be void. No photocopies or mechanical reproductions accepted. LIMIT: one (1) entry per person/address per day. Sponsor is not responsible for lost, late, illegible, mutilated, damaged, stolen, misdirected, or incomplete entries. Random Drawing: A random drawing will be conducted by Promotional Participant on or about one business day following the deadline entries must be received by, from among all eligible entries received at the participating store location. Decisions of Sponsor or store management are final and binding in all matters related to this Sweepstakes. Prizes & ARV’s: See the ROCKSTAR entry box and/or in-store point-of-sale materials for prize details. Prizes consist of only those items specifically listed as part of the prize on the ROCKSTAR energy box or point-of-sale materials. No substitution, cash redemption or transfer of prize by winner permitted, but Sponsor reserves the right to substitute prize of equal or greater value. Limit 1 prize per person/household. Odds of winning depend on the number of entries received. Potential winners will be notified by store management by phone or mail. If a potential winner cannot be located or doesn’t respond within 5 business day, he/she will be disqualified and an alternate winner may be selected, at Sponsor’s sole discretion. Awarding of the Prize is subject to verification and compliance with these Official Rules. Entrants are responsible for complying with all applicable federal, state and local laws and regulations and with these Official Rules, and by entering, Entrants agree to be bound to these Official Rules.. Any attempt by an entrant or other party to tamper with the proper administration of the Sweepstakes will be disqualified. WINNERS AND ENTRANTS AGREE, EXCEPT WHERE PROHIBITED BY LAW, TO RELEASE AND DISCHARGE, HOLD HARMLESS AND INDEMNIFY SPONSOR, PROMOTIONAL PARTICIPANT AND THEIR RESPECTIVE PARENTS, AFFILIATED COMPANIES, SUBSIDIARIES, SUCCESSORS, ASSIGNS, PRIZE SUPPLIERS, PRINTERS, ADVERTISING AND PROMOTION AGENCIES AND EACH OF THEIR RESPECTIVE EMPLOYEES, OFFICERS, DIRECTORS, REPRESENTATIVES AND AGENTS AND ALL OTHERS ASSOCIATED WITH THE DEVELOPMENT AND EXECUTION OF THIS SWEEPSTAKES, FROM ANY AND ALL TAX LIABILITY THAT MAY BE IMPOSED OR ASSOCIATED WITH RECEIPT OR USE OF THE PRIZE, AND FROM AND AGAINST ANY AND ALL CLAIMS, ACTIONS, PROCEEDINGS, AND LIABILITY FOR ANY DAMAGES, EXPENSES, FEES, INJURY OR LOSSES SUSTAINED IN CONNECTION WITH THE RECEIPT, OWNERSHIP, OR USE OR ENJOYMENT OF ANY PRIZE OR WHILE TRAVELING TO, PREPARING FOR, OR PARTICIPATING IN ANY SWEEPSTAKES-RELATED OR PRIZE-RELATED ACTIVITY. If, for any reason, the Sweepstakes is not capable of running as planned by reason of, but not limited to, tampering, unauthorized intervention, fraud, technical failures or any other causes which Sponsor deems could corrupt or affect the administration, security, fairness, integrity or proper conduct of this Sweepstakes, Sponsor reserves the right at its sole discretion to cancel, terminate, modify or suspend the Sweepstakes and, if terminated, at Sponsor's sole discretion, select the winners in a random drawing from non-suspect, eligible entries received prior to the action or as otherwise may be deemed fair and equitable by Sponsor. In no event will the number of prizes awarded exceed the available number of prizes as specified in these Official Rules. Except where prohibited, all issues and questions concerning the construction, validity, interpretation and enforceability of these Official Rules, or the rights and obligations of the Entrant and Sponsor in connection with the Sweepstakes, shall be governed by, and construed in accordance with, the laws of Nevada without giving effect to any choice of law or conflict of law rules. Should any provision of these Official Rules be deemed unenforceable or invalid, the other provisions of these Official Rules shall remain in full force and effect. By accepting a Prize, winner consents to the publication and use of his/her name, biographical information, voice, likeness and photographs in any form, manner or media whether now known or hereafter devised, including, without limitation, in print, radio, television and on the Internet for any purpose in connection with the Sweepstakes including, without limitation, for the purposes of advertising and trade, and promoting the Sponsor and each of its products and services, without further notice or compensation. Sponsor: the participating store where the sweepstakes is being conducted as set for on the in-store abbreviated rules.